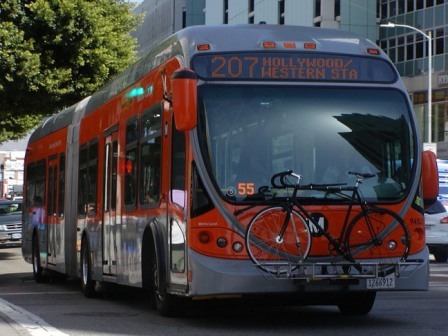 As ridership on Southern California’s largest bus network dropped steadily in recent years, transportation officials expressed confidence the decline was temporary and riders would soon return, according to the Los Angeles Times. Metro attributed the drop to factors beyond its control, including more people buying cars, cheap gas and a recent state law that allows immigrants who are in the country illegally to obtain driver licenses. Now, transportation officials are considering another explanation for why riders have stopped taking buses: The service isn't good enough, The Times reported. After months of preliminary research, Metro officials acknowledge that Los Angeles County’s sprawling bus system isn’t working as well for riders as it once did. Metro bus ridership fell 18 percent in April compared with April 2015. The number of trips taken on Metro buses annually fell by more than 59 million, or 16 percent, between 2013 and 2016, according to The Times. A recent survey of more than 2,000 former riders underscores the challenge Metro faces. Many passengers said buses didn’t go where they were going — or, if they did, the bus didn’t come often enough, or stopped running too early, or the trip required multiple transfers. Of those surveyed, 79 percent now primarily drive alone. To stem the declines, Metro is embarking on a study to “re-imagine” the system’s 170 lines and 15,000 stops, officials told The Times. Researchers will consider how to better serve current riders and how to attract new customers, and will examine factors including demographics, travel patterns and employment centers. “We’re misaligned with current travel demands,” Conan Cheung, a senior executive officer at Metro, told The Times. The agency hasn’t overhauled the bus system in more than 25 years, since the countyís first modern rail line began running between Long Beach and downtown Los Angeles, he said. The results of the study, expected in April 2019, could lead to a possible overhaul of the bus network, including where buses go, what time they run and how often they arrive.